At about five o’clock on the afternoon of 26 January 1808, Major George Johnston of the New South Wales Corps led his men from the barracks in Bridge Street. They marched in a line two or three deep along the streets of Sydney to Government House. They carried the regimental flag, and played The British Grenadier. They carried their weapons, with bayonets fixed. 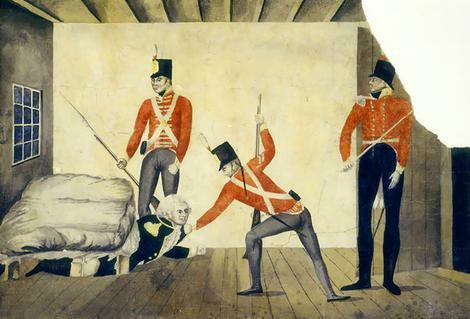 Their plan was to arrest Governor Bligh. Arriving at Government House, they found the governor’s daughter and a number of his supporters who had just finished dinner, but they spent some time hunting for her father, until he was found in an attic bedroom. He would later say he was destroying documents there. The soldiers insisted he was hiding under a bed.